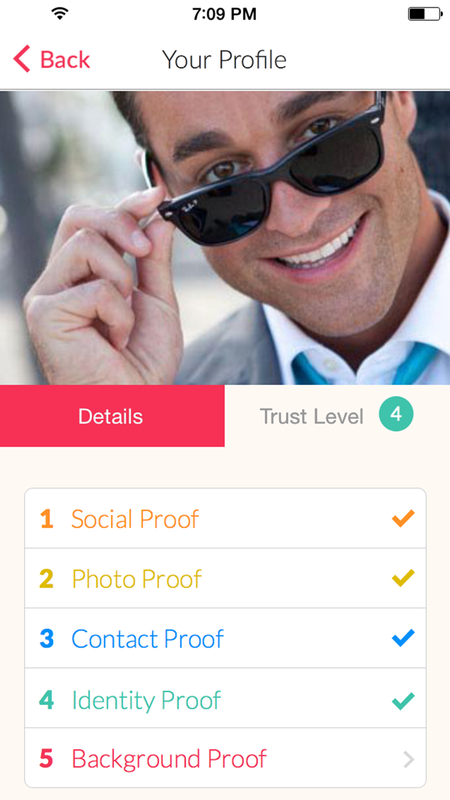 Get a verified link to your love life to prove yourself and others anywhere you meet. If you haven’t learned by now, Love Lab is not just another dating app. Its meant to complement every single dating site, service, app and avenue of meeting someone there is. Now everyone on Love Lab has a link to their love life that can be shared with anyone, anywhere so you can prove you are who you say you are. Mine is http://lovelab.com/LOVELAB. Not only can you see my verified name and age, but you can also see a watermarked photo that was verified against an instant selfie I took for likeness. Unfortunately, I am not a level 5. Want to know why? If we met in person I’d be glad to show you my background check. If you fail the check we store the results in the app for your eyes only. What can I say? In my younger days I was hell on wheels. Only people with squeaky clean backgrounds earn the highest level of trust. On your personalized profile page we give instructions for how to request contact with you on the app. When you, or someone else enters a valid Contact Code the corresponding profile is presented. When the person entering the code pluses the profile, a match request is sent to the profile owner, who can accept or reject the request. If accepted, the match is created. Then, not only can you text you can share instant photos and videos taken with the camera in the app that will disappear after they’ve been viewed once. You can also match with other verified users already on the app when you plus a profile in the Discovery area that interests you. We rank every user from highest to lowest trust level and within each trust level based on their likability, (i.e. the highest proportion of pluses to minuses). So if you want to be more prominent to others its in your best interest to reach the highest level of trust possible. We’ve found that likability is directly correlated to how complete a profile is in terms of photos, details and trust level. More trusted users are liked much more. So why bother with first date surprises or disappointment ever again? Use Love Lab to create trust and chemistry before you date. If you want any help with your love life, meet me on the app and I’d be happy to share my thoughts. My Contact Code is Love Lab. Download the app today!